With a lease signed, the applications for funding and the winery license submitted, and our banner now hanging proudly in the window of our downtown Carlisle storefront, we thought it would be a good time to reflect on what it is we are trying to create for you. This is the story of Grand Illusion Hard Cider. We could say it began on a morning walk through an apple orchard, fog lifting, trees laden with heavy fruit, waiting to be picked. We could say it all started when one of us took that first sip of hard cider from a wooden barrel, hidden in a friend’s New Hampshire farm basement over 20 years ago. Or, we could say it came to us in a dream, where we envisioned a business unlike anything we’ve encountered before, and awoke excited about the idea. But none of that would be true. Grand Illusion Hard Cider was born out of a desire to turn the traditional tasting room and dining experience on its head. We just grew tired of being disappointed, unimpressed and board with the experiences available to us. Little was memorable. And given some research, we found that you were seeking something different, too. It use to be enough to slap a piece of wood between two wine barrels, pour four-day old wine, decorate with fake grapes and Christmas lights, and treat everyone like they were on an assembly line, spitting out the same script for each pour, and rarely ever looking the customer in the eye. With limited seating (if any), poor music (if any), and limited brand identify (if any), yesterday’s tasting rooms resembled a Hallmark store-styled gift shop with its disorganized collection of wine-related merchandise scattered and cluttered about. Customers are savvy and smart, and due to their travels and marketplace experiences elsewhere, they have high expectations. Traditional experiences with their uninspired ambiance and mediocre service, at best, just don’t cut it anymore. Today’s wineries should be wine bars! Cideries should be cider bars! And producers of craft distilled spirits should be cocktail bars! The guest experience should be front and center. At Grand Illusion, we hear you. What we are dubbing “The Grand Illusion Experience” is made up of four parts: enlightened hospitality, superior customer service, a magical atmosphere and handcrafted, mouth-watering, fermented beverages. At the core of our business philosophy is “enlightened hospitality.” The concept comes from a book written by the famed New York City restaurant owner, Danny Meyer, called “Setting the Table.” While customer service is how we deliver the product, hospitality is how that delivery makes you, the customer, feel. There is a great difference between a “scripted monologue” (we’ve all experienced the, “hello, my name is…can I start you off with something to drink?”) and a “genuine dialogue,” something that makes you feel we are on your side, with you, and not above, beyond, or outside you. “It’s human nature for people to take precisely as much interest in you,” Meyer writes, “as they believe you are taking in them.” The staff at Grand Illusion will also be expertly trained and certified in beer, wine and all things hard cider, in order to offer you much more than the drink. There will always be a standing invitation to take that educational journey with us. As for atmosphere, would you rather enter a space that is mysterious, surprising, engaging, enchanting, uplifting and stimulating, or would you rather drink and dine in a vanilla box, decorated with discounted Michael’s merchandise hanging from the walls? Where is the thoughtful music, the intentional lighting, and the inspired décor? We hear you. At Grand Illusion, we firmly believe that you deserve a level of entertainment that transcends the live band; you should be entertained by the food and drink you consume, by the service and interaction you receive, and by the physical environment within which your overall experience takes place. 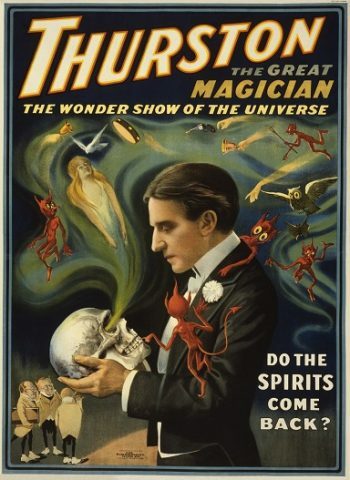 The Grand Illusion brand, itself, was inspired by turn of the century magician posters. Their imagery, the colors, the grand declarations gave a sense of wonder and mystery. Our goal is to replicate these emotions, and to bring you the same sense of wonder and mystery that have engaged audiences for hundreds of years. We know it will be a challenge, but it is one that we look forward to confronting in order to bring you an experience to remember. And yes, there might even be a little table magic from time to time to keep things interesting. No stone will be left unturned—we promise! We’ve left the best for last—the fermentables. Hard cider is the fastest growing beverage category in the US. More and more people are trying it, and are enjoying it as an alternative to beer or wine. Cocktails, too, have returned, and are offering people stories and styles that were once lost to the history books. Why not put them all together, in one place? We did, because we hear you. At Grand Illusion, we wanted to showcase the variety of things you can do with pressed, fermented apple cider. While we will be making our own cider on site, we will also provide you with other Pennsylvania offerings, and some from Michigan, New York and beyond. Our own ciders are inspired by ciders from the West Coast, particularly Portland, OR, where they are doing a lot with added fruits, hops and other beer-like production practices. Our wines will be on draft, and will be poured at the correct temperature and at the peak of freshness, just like the day they were kegged. Kegged wine is superior as it does not expose wine to light, there is no chance of cork taint or oxidization, and it saves glass from landfills. And since Grand Illusion will be like nothing you’ve seen before, so will our craft beer and cocktail offerings. Our inspired food menu, too, will play a central role, and will showcase items that pair well with wine, beer and cider. We go to bars, restaurants, wineries, craft breweries and distilleries because in some way, they help us tell our story. Our job, at Grand Illusion Hard Cider, is to help give you a story worth telling.